Sunday 3 July 1994: We awoke early, after not sleeping well, and decided that we wanted to go to a beach. So, we began the 700 mile drive across Texas to Corpus Christi, on the Gulf of Mexico coast. The journey began by heading south-east along I-10. The city seemed to go on for a long time, but eventually we passed the last shopping mall and entered the wasteland that is west Texas. For 60 miles or so, the highway followed the Rio Grande, before turning more directly east through the barren Sierra Blanca Mountains. First stop was Van Horn, looking for a bank. We found one, but it was shut and there was no teller (cashpoint). Continued to the historic town of Fort Stockton, which had a motto 'You may never pass this way again', although next week we would. This had, amongst other things, the world's largest road runner (a type of bird), but we didn't stay long as there was a long distance to go. We did break for 40 minutes sunbathing at the Overland-Butterfield Stage Stop, a rest area on interstate 10 at the site of a former stage wagon stopping place. There wasn't much to see, just a small reconstruction of the original building, and no signs of civilisation to the south, only featureless desert. Vultures circled hopefully overhead as we lay down for a few minutes rest - they were must have been disappointed as we recovered and moved away. Overall, the highway from El Paso passed through rather monotonous country, not at all like the spectacular landscapes of Arizona or Utah. We continued as far as Sonora and followed signs to the local RV site, but didn't stop as it looked slightly weird. 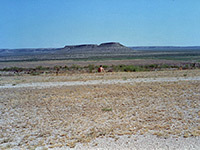 Instead we went a little way back towards I-10, stopped on a side track, collected firewood and began to prepare a meal. Suddenly, a truck load of Indians arrived "Sorry, but my father the boss, he say you can't stop here". 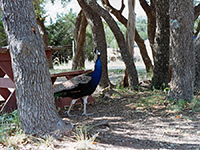 We were directed reluctantly back to the RV site to be welcomed by the dubious 'manager' who seemed to be expecting us. As well as other RV's, the site was occupied by noisy peacocks and a peculiar outside theatre, which continued all evening with (understandably) only four people watching the extremely amateurish acting and singing.